The Mare Forum will convene for its next marathon talking session in Athens, on Monday-Tuesday September 25 and 26, preceded by a warming up evening reception on Sunday. The Mare Forum calls itself a unique channel for communication between regulators, implementers and enforcers, at the highest level of both government and industry, and with a global outlook. 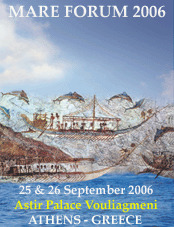 Its first session was held in Amsterdam some 10 years ago, and this Athens gathering will be asked to focus on the Green Paper on Maritime Policy, published by the European Commission two months ago and which sets out the building blocks of an integrated strategy on maritime affairs. Shipping is just one of the envisaged key elements, but, as the announcement brochure states, of no less importance than any of the other elements, which concern the wider uses of the seas and oceans, energy issues, coastal management and development, among others. There will be sessions dedicated to shipping market issues including supply and demand forecasts, finance and investment, and human factor issues, such as maritime recruitment and labor standards, sea skills, and criminalization. The numerous confirmed speakers include legislators, policy-makers and industry figures from around the world. Lloyd’s List maritime editor and commentator Michael Grey, will again chair the session with the support of Mare Forum Managing Director, Jannis Kostoulas. Telephone +31 (0)10 281 0655. The conference hotel is the Astir Palace, 40 Apollonos Street, 16671 Vouliagmeni, Athens, Greece.